I had a nice little treat that arrived a few days before Christmas, my Winter FabFitFun VIP Box. I love my subscription box, and lets be honest, even though it was technically a little gift to myself, it was fun to get to dive into some gifts a few days before all the festivities began. I love my FabFitFun VIP Box because it's full of great new to me products usually worth over $200 (this edition was worth over $300!) for $49.99. But if it's your first time ordering the box there is usually a coupon out there. *Use code NEW5 to get $5 off your first box. FabFitFun has no idea who I am, I just love the treat of their boxes every season. Another cool thing is you can order additional boxes at a discount, and they make fun cool gifts. In fact I gifted the winter box to my sister for her birthday and it was a hit. 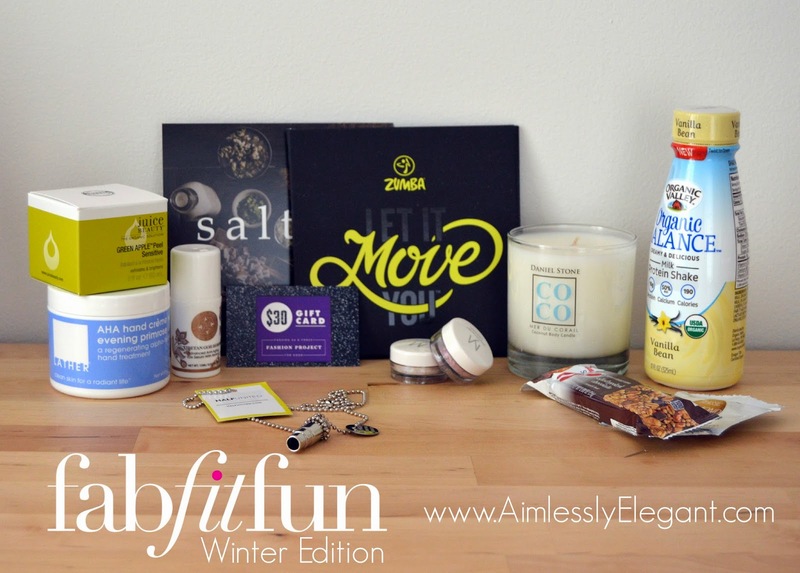 Check out what was in my FabFitFun VIP Winter Box. I'm excited to give the Juice Beauty Green Apple Peel, anything that claims to help with fine lines and wrinkles, plus it's organic. Speaking of skin care I'm also looking forward to giving the Passport to Beauty Tibetan Goji Berry Intense Anti-Aging Eye Serum a go, I'm always looking for something to help combat my dreaded under eye area and I love getting to try out these more expensive potions for a fraction of the cost. There were a few other beauty items in this edition, the yourMinerals Eye Shadow Duo and the Lather AHA Hand Creme. I haven't cracked into the eye shadow yet, though I'm excited about the colors I got, but I have started using the hand cream. Not only does it smell great, but it's nourishing without being greasy, and for a hand cream the container is huge so I can only imagine it will last me a pretty long time. This box also included a Half United Fighting Hunger Necklace, the profits of this necklace help to feed children in need. I like that not only do you get to try cool new things, but they also incorporate a way of helping others in the process. As well there was a Zumba DVD and $25 Gift Card, which lets be honest is a much more fun way of getting that cardio in then hitting the treadmill, and it's perfect for these subzero days when it just feels too darn cold to make the trip to the gym. The Daniel Stone COCO Candle smells great, I catch a sniff every time I walk by it, and I haven't burned it yet, but I can only imagine it will smell even better when I do. Then there was a 3 month membership to Salted TV, which is like Netflix for cooking, which I am pretty psyched about. I love spending time in the kitchen, and Martin and I loved the cooking class that we did years ago, so I'm looking to enhance my skills even further! As if that wasn't enough great stuff already there was is also a $30 Fashion Project Gift Card, which who can pass up some 'free' shopping, certainly not me! And a couple of food items, the Organic Valley Organic Balance Milk Protein Shake and Special K Snack Bar will be going to my husband, but I will enjoy the Justin's Classic Almond Butter. This box seriously had a ton of stuff packed in it, as they always do! Are you a FabFitFun VIP yet? Woah, you hit the jackpot with this box! So many goodies - can't wait to hear your thoughts on everything! There are so many great things, I always feel like it takes me awhile to get around to trying everything out just because there are so many!